Created to contain, identify, preserve, protect, group and transport goods from production sites to consumption, packaging has a cross-sectional presence in industrial, consumer and household activities and is a constant element in our daily gestures. In its long history, packaging has acquired an increasing number of functions that today represent consolidated characteristics, necessary for its correct functioning, attributable to a generating principle: ensure that a product arrives intact at its final consumer, thus avoiding it becoming premature waste. According to legislation, packaging is "the product, consisting of materials of any kind, used to contain certain goods, from raw materials to finished products, to protect them, allow their handling and their delivery from the producer to the consumer or user, ensure their presentation, as well as disposable items used for the same purpose". While it is possible to group these primary functions into a set that we could call "structural", there are other functions of a "communicative" nature that have strengthened the message and meaning elements held in the packaging to differentiate products, attract and inform the consumer, and create buyer loyalty. Packaging also communicates a whole series of other information about the product that must be made available to the consumer (e.g. : expiry date, hazard risk of the product, ingredients, etc.). Subsequently, a third group of services was added to these well-established functions to offer more "service" contents, which also led to the creation of "functional", i.e. active and/or intelligent, packaging. In fact, it is expected that packaging also helps the end user, providing information on the characteristics, properties, composition and manner of use of the product, facilitating use of the packaging itself and its content, at the same time extending its useful life as much as possible. In fact, end users expect packaging to protect and preserve the contents over time, take up as little space as possible, be easy to open and use, provide precise instructions on how to store the product and that it is easy to understand what to do with regard to its end-of-life. Content and container are not separate elements, but rather interact in order to improve the performance and the life of the packaged product. Precisely this relationship between container and content - and the ability to design the former in a way closely connected to the latter to ensure safety and quality of the whole - represent one of the essential elements of packaging design and are at the heart of its innovation. Directive 94/62/EC, in fact, recognised the "fundamental social and economic function" of packaging and its value as a product capable, if well designed and managed throughout its life cycle, of reducing waste and preventing other goods from turning into waste before they have even reached the final consumer. As an example, if we consider the food sector, according to data collected by the World Health Organization, the deficiencies in or inadequate use of packaging in developing countries has led, in recent years, to the loss due to deterioration of 30 and 50% of food before it arrives at the final consumer, due to damage during transport and difficulty in product preservation. In Europe, from the moment of production to that of purchase (excluding waste that occurs after purchase, for example the products that are thrown away because they have reached their expiry date) this percentage falls to 3%. FAO argues that increasing the use of adequate packaging could immediately reduce food waste in developing countries by 5%, thus providing 39 million tons of food. Properly designed and produced packaging has, therefore, an essential function in preventing the loss of resources used to produce, grow, breed or manufacture the contents of the pack. These resources are significant: according to the Italian Institute of Packaging, all LCA studies of packaged and EPD (Environmental Product Declaration) certified food products available today show that the environmental impact of the foodstuff is, on average, four times greater than that of the related packaging. Any loss of the product contained would, therefore, have significant environmental impacts with consequent waste of resources. Packaging has also led to a reflection on its impact from the environmental point of view, given the limited time within which, often, it ends its first useful life. With the aim of exploiting materials and converting packaging waste into a resource, Europe has always focused on prevention and correct management of packaging once it becomes waste. For this reason, in 1994, it established important recycling objectives, subsequently increased in 2004, and which are still under discussion today in a broader and more organic process of review of EU directives on the best use of resources, environmental protection and waste management, summarised under the term "Circular Economy Package". Member States have had to get organised in order to achieve the recycling and recovery targets set by European and national legislation and to prevent the environmental impacts of packaging waste throughout its life cycle, based on "the principles of precaution and preventive action", according to the correct hierarchical management of waste, as well as on the "polluter pays" principle. At this point, the same producers and users of packaging that are the protagonists of the national and community environmental challenge were involved in the achievement of the community objectives, in a process guided by the essential requirements attached to the directive, according to which "packaging must be manufactured in such a way as to limit the volume and the minimum weight necessary to guarantee the necessary level of safety, hygiene and acceptability, both for the packaged product and for the consumer"; it must also "be designed, produced and marketed in such a way as to allow its reuse or recovery, including recycling, and to minimise its impact on the environment if it is disposed of". Alongside this, the Directive embodies the principle of extended responsibility of the producer which is responsible for the correct management of the packaging once it becomes waste, preferring recyclable and recoverable solutions. Waste prevention and management are, in fact, strongly interconnected and each goes hand in hand with the other. In fact, in Europe, the concept of sustainability of the packaging supply chain is today closely linked to Directives 94/62/EC and 2004/12/EC, based on the "from cradle to cradle" life cycle approach, which have led to adoption of evaluation and action tools such as Life Cycle Assessment (LCA) and Life Cycle Thinking (an integral part of product design methods) and introduced specific objectives for the recycling and recovery of packaging materials. With a view to reducing the environmental impact of packaging and the efficient use of resources and materials, the European Commission has introduced the hierarchical packaging waste management principle, which establishes a declining order of preference for management methods: in first place there is the concept of prevention, aimed at improving packaging from the point of view of limiting environmental impact and resource use, followed by reuse, recycling, recovery (e.g. energy) and finally disposal, considered the last possible solution only if all the others are not practicable. Looking at this list of priorities, it is clear that the options preferred by legislation are also those in which it is necessary to intervene before production and, consequently, in a phase related to product design. Within this process of growing attention to the issues of sustainability, proper waste management and environmental responsibility, are the concepts of recycling and design for recycling. By recycling is meant "any recovery operation through which waste materials are reprocessed to obtain products, materials or substances to be used for their original function or for other purposes, including organic recycling and excluding energy recovery". The Community (Directive 94/62/EC, and subsequent updates) and national legislative provisions on packaging (Legislative Decree 152/2006, and subsequent updates) and on the essential requirements, establish that packaging must be produced in such a way as to allow the recycling of a certain percentage by weight of the materials used, in the manufacture of marketable products, respecting the legislation in force in the European Union. The determination of this percentage may vary depending on the type of material constituting the packaging. To this end, the European Committee for Standardisation (CEN) has published (with Decision 2001/524/EC) the technical standard "EN 13430: 2005 - Packaging - Requirements for packaging recoverable by material recycling". Therefore, recyclability is one of the elements to consider when designing packaging in order to ensure its correct end-of-life management. As we have seen, however, it is not the only one and only comes after the evaluations of functionality and the service that the packaging must provide for the product. Plastic packaging waste is one of the most complex examples to be addressed, given the variety of polymers, properties and applications. Furthermore, the higher the quality of the packaging and the possibility of increasing the shelf life of the products it contains, the more likely managing the end-of-life of these objects will be complex. It is precisely for this reason that the careful intervention of designers becomes fundamental in rendering production increasingly aligned with the requirements of the circular economy, in which the "waste" of one production process becomes the "food" for another process. Based on the foregoing, this document aims to provide packaging designers, manufacturers and users certain design information useful for facilitating the recycling of plastic packaging for household use. Why a guideline addressed to designers and companies? Because it is estimated that the design phases can affect about 80% of the impacts related to packaging and it is therefore important to always focus attention on and promote knowledge on issues related to packaging sustainability and responsibility for those who design and use it. The goal is to clarify certain needs, problems and potential of packaging recyclability, in order to stimulate an increasingly responsible innovation of products and processes related to the plastic packaging supply chain. The tool identified is that of the guidelines, accompanied by specific check lists. The approach chosen is to make available to designers and companies a common basis for discussion on such a complex yet little known subject, it being clear that there are no valid indications in the absolute sense for each type of packaging: packaging has many differences in terms of structure, composition and performance that lead to consequent differences in the management of the end of its first useful life. For this reason, in the design phase, to ensure an effective improvement of environmental performance in terms of recyclability, it is essential to involve the players in the supply chain in question and verify the results obtained from the packaging-product combination throughout the life cycle, with the support of industry experts. The issue of packaging recyclability also requires that the real possibilities offered by current sorting and recycling technologies installed at the industrial level (technology state of the art) in a given geographical area are always taken into consideration. The indications provided will, therefore, be periodically updated by CONAI. Knowing the processes and their specific issues helps to understand which phase a project choice can influence and which are the most suitable alternatives. 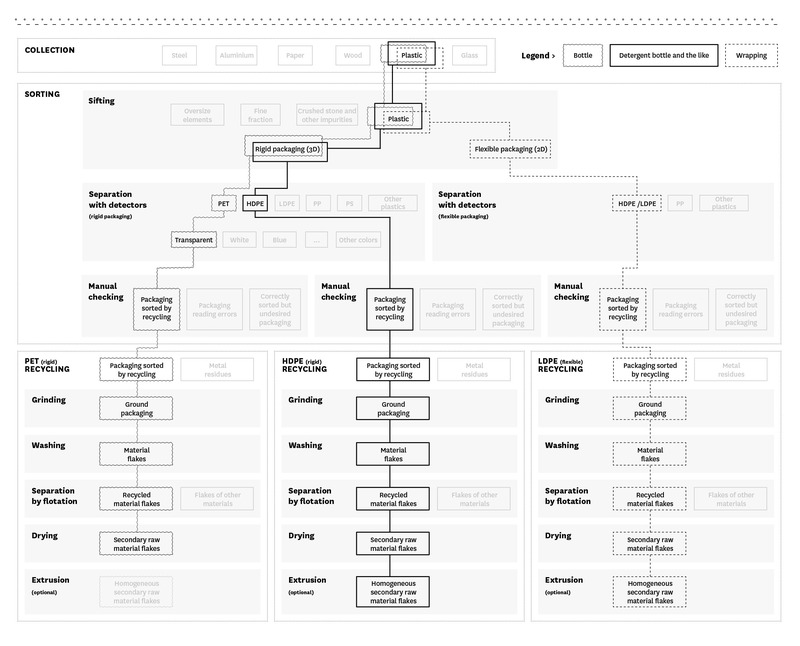 To meet the needs of designers and companies, this document has been divided into four parts, following a process that leads to understanding the main reasons that support each of the proposed design indications. The first part, in fact, describes the plastic materials used in packaging, their characteristics instrumental to containing and protecting the products, their main applications and their general end-of-life management. The second part describes and illustrates plastic packaging collection, sorting and recycling processes, highlighting the points of greatest attention. The third and the fourth parts present the resulting guidelines, useful for facilitating the recycling of plastic packaging for the household circuit and which, therefore, at the end of its life cycle, ends up in separate collection managed by municipalities, and provide technicians and designers with two check lists useful in packaging design and development, and as a tool for assessing what has been achieved to identify possible room for further improvement. These indications should be construed as a basis on which to start a process of paying increasing attention to facilitating sorting and recycling activities. Precisely because the guidelines presented here have the aim of highlighting problems and possible solutions, but do not claim to be exhaustive and to deal with all the situations that can arise in a differentiated manner, all the references of the sources consulted for preparation of the document and regulatory information useful for going into more detail on the contents of the various chapters are provided. The first choice of the designer concerns identification of the material and packaging type most suited to the characteristics of the product to be contained. With reference to the functions that the packaging must perform, the choice of materials is decisive in the design phases because this determines its performance, production methods, appearance and recycling possibilities. In fact, one must consider that the materials with which the packaging is made also affect the visual and tactile sensations of the user. Therefore, the designer must take into consideration not only the exclusively functional aspects, but also the tactile, visual and sensory aspects that can influence the choice of material. The choice of material for a specific type of packaging becomes fundamental also when the designer thinks about the end-of-life of the packaging when it becomes waste. Consequently, providing designers with expertise on materials and the impact on recycling of the various possible combinations of plastic materials and packaging types is a first step in initiating innovation processes in the development of new packaging solutions that are more easily recyclable. In fact, it is important to consider that, with the current state of technology, a large part of the end-of-life that packaging will have once disposed of in separate collection will be determined by the combination of packaging types and materials. As we will see later in the document, in fact, the material-packaging type combination and the interaction of the different components made with different materials, are the main elements to consider in order to design packaging without compromising its recyclability. Recyclability that can be assessed on individual packaging but which then largely depends on what that packaging will be merged with as a result of the collection and sorting phases, and of the processes that will characterise its management in its end of life. Plastics are classified according to an identification system developed by the Society of the Plastics Industry (SPI) in 1988 and adopted at European level in Commission Decision 97/129/EC. The classification is used for the identification of material for recycling purposes and envisages an encoding of the most common polymers marked with abbreviations and numbers from 1 to 6, while the number 7 refers generically to all other types of plastics. It should be noted that Commission Decision 97/129/EC does not prescribe the environmental labelling obligation of packaging which at present remains voluntary. It should be remembered, however, that if a company intends to adopt environmental labelling that certifies the material the packaging is made of, whether or not it is recyclable and/or any recycled content, the reference to current legislation is mandatory. The following is a description of polymeric materials according to the identification system defined in Decision 97/129/EC. This description makes it possible to understand and contextualise the design indications presented in this publication. PET is a thermoplastic resin belonging to the polyester family and obtained by polycondensation from terephthalic acid and ethylene glycol. It is a shock-resistant polymer with good mechanical properties. In the amorphous state, it is transparent and colourless and is generally processed by injection moulding, extrusion and stretch-blowing. PET is widely used in the production of beverage bottles, trays and containers. It is possible to obtain extremely light bottles with excellent resistance to permeation of gases such as carbon dioxide, dissolved in carbonated drinks. Furthermore, the material has a good resistance to cracking stress, i.e. the ability to resist deformations under constant stresses, as in the case of prolonged storage of bottles containing carbonated drinks. Its mechanical and thermal resistance qualities allow the use of PET in both rigid and flexible packaging sectors, especially for the production of trays. Both in bottles and in trays, the barrier properties can be further increased by using multilayer structures with other polymers or by using additives. Recycled material (r-PET) maintains characteristics very similar to the virgin polymer. Current sorting and recycling technology means that PET bottles (the main application of this polymer in the packaging sector) are among the most easily sortable and recyclable packaging types, where there are no ancillary elements which complicate the process. Normally, PET bottles are sorted in three distinct flows: transparent, blue-tinted and coloured (mix of various colours). The recycled polymer obtained starting from the first two flows has mechanical and colour characteristics very close to those of the virgin polymer, other than a slight yellowing, and, with appropriate decontamination and macromolecular chain recovery processes, can be reused for the production of containers intended for contact with food, including new bottles. Thermoplastic resin of the polyolefin family, obtained from the polymerisation of ethylene. HDPE is a polymer with high mechanical resistance, with good rigidity and barrier to humidity and chemical agents. Opaque, odourless and non-toxic, it is commonly processed by injection moulding, extrusion and blowing. Thanks to its characteristics of resistance and rigidity, it is particularly suitable for use in the packaging sector for the production of bottles, jars and rigid containers for food, detergents and chemicals. It is also used for the production of crates, caps, drums, technical items, household goods, toys and furniture components. The mechanical properties of the recycled material are similar to those of the virgin polymer, even if there are often residues (pigments or additives) deriving from the previous use that may affect the quality. There are numerous applications for recycled HDPE. Today, sorting and recycling technologies guarantee a high degree of recyclability of HDPE packaging where there are no ancillary elements which complicate the process. In particular, bottles in HDPE, widely used for foodstuffs and home and personal care products, are among the easiest packaging types to sort and recycle due to their characteristics. PVC is a vinyl thermoplastic resin obtained from the polymerisation of vinyl chloride. The polymer has good wear, chemical, fire and deterioration resistance properties. PVC can be processed by injection moulding, compression and blowing or by the use of extrusion, calendering and thermoforming technologies. PVC is mainly used in the production of both rigid (PVC-U) and flexible (PVC-P) semi-finished and finished products, the latter thanks to the addition of plasticisers. In the packaging sector, PVC is used for the production of cosmetic containers and bottles, labels, blisters and single-portion packs. It is widely used in the construction industry, also in outdoor applications, from components to the production of floorings, coatings, building pipes (for example gutters and drinking water pipes), window frames, tarpaulins and rigid and plastic films. It is also widely used in the medical and hospital sectors, in the chemical industry and in the automotive and agricultural fields. For household PVC packaging, it is currently complicated to create efficient recycling flows due to the limited quantities of packaging made with this polymer present in separate collection. It is, on the other hand, successfully recycled in other sectors, such as the construction industry. LDPE is a thermoplastic resin of the polyolefin family, obtained from the polymerisation of ethylene. Unlike HDPE, it consists of a branched molecular structure, which makes it a lighter, more transparent, ductile and flexible material. It has a good chemical resistance to acids and bases, high impermeability to water and excellent electrical insulation and transparency characteristics. LDPE can be subjected to the most common moulding, blowing and filming processes and can also be laminated with other materials. LLDPE (linear low-density polyethylene), which offers greater resistance to tearing, but lower workability compared to LDPE, also has similar characteristics. LDPE is applied and widely used in the production of flexible products such as film and bags, both used for packaging and, for example, for the production of sheets used in agriculture. Other applications of low-density polyethylene include cable coatings, flexible pipes and, more generally, packaging and components that require flexibility and resistance to deformation. Recycled LDPE maintains the mechanical properties of the primary material, even if it loses the original transparency during recycling and reprocessing. The degree of recyclability of LDPE packaging is linked to the heterogeneity that distinguishes the possible applications in the packaging field. For example, much flexible LDPE packaging is printed on the outside, metallised or laminated with aluminium or has multi-layer structures with other polymers. PP is a thermoplastic resin of the polyolefin family, obtained from the poly-addition of propylene. Due to its molecular structure it is characterised by good thermal resistance and high rigidity and is a barrier to the permeation of water vapour but not of gases. A characteristic that makes it, for example, unsuitable for the packaging of carbonated drinks. PP is a polymer that has characteristics of great versatility as regards its workability that takes place through the most common conversion processes, thanks to which flexible or rigid, transparent or opaque material can be obtained. The characteristics of PP make it suitable for use in various sectors. It can be used in the production of many commonly used objects, from household items and toys, to the medical and home appliances sectors. In the packaging sector, trays and rigid bottles or flexible films and tapes are obtained. Recycled PP maintains the physical characteristics of the virgin polymer without any particular aesthetic defects, provided it is correctly separated by colour before the recycling process. The degree of recyclability of PP packaging is linked to the heterogeneity that distinguishes the possible applications in the packaging field. PS is a thermoplastic resin obtained by poly-addition of styrene. It is a light material with characteristics of rigidity, luminosity and transparency. It has excellent resistance to external agents, but is very sensitive to impacts. This defect can be overcome by adding rubber (HIPS) or by converting the material into expanded polystyrene (EPS), obtained through a process of insertion of expanding gases such as pentane. PS is processed by injection moulding or produced in sheets and plates of different densities intended for thermoforming. Polystyrene finds numerous uses, especially in the packaging sector, in the manufacture of disposable tableware, office items, single-portion containers and displays. The expanded version is used in the production of protective and shock-proof packaging, such as crates, and of lightening, insulating and sound-absorbing products for the building industry. The recyclability of rigid PS packaging disposed of in household separate collection is influenced by the low impact resistance of this polymer. In fact, due to the mechanical stress that it undergoes during the collection and sorting phases (bag tearing, sifting), PS packaging is fragmented into parts that are too small and light to be selected in a sufficiently homogeneous rigid PS flow to be recycled. Moreover, much expanded PS (EPS) packaging, like the trays used to pack meat or creamy products, are contaminated with product residues and therefore difficult to recycle. Advances in sorting technologies will most likely, in the future, make greater precision in the positive sorting of small fragments, and thus their recycling. Experiments are underway in this regard. The problem does not arise, or arises to a far lesser extent, if the EPS is collected a priori in a homogeneous and clean flow, for example by the disposal of uncontaminated packaging at a sorting centre (as in the case of elements for the protection of furniture and appliances). This category includes all polymers without a specific identification code, together with the combinations of polymers that cannot be separated by simple mechanical action (this is the case of multilayer flexible packaging, constituted, for example, by a layer of PE sandwiched between two layers of PET. Since the three layers are welded together, they cannot be separated from one another with a mechanical operation, such as reducing them to flakes). This category includes a series of polymers whose use in packaging production is, at the moment, limited, and it is therefore not considered necessary to assign a specific code. These include, by way of example, Polymethylmethacrylate (PMMA), Polycarbonate (PC), Polyurethane (PUR) or Polyamide (PA or nylon). This category also includes many biopolymers and/or biodegradable polymers, whose use in packaging production is becoming more commonplace. Since this category includes many polymers and combinations thereof, it is difficult to identify specific applications. In general, they are used to obtain performance and characteristics that cannot be obtained with the polymers belonging to the previous categories. This is the case of much multilayer packaging, in which one or more layers of the main polymer are used, which give the packaging the required mechanical properties, in combination with layers of other polymers that provide the packaging with specific characteristics, such as a barrier effect or a surface finish more suited to printing with several colours. Sometimes the layers of the different polymers are held together by adhesives (tie layers). Precisely because this is a very varied category, only general considerations can be made with regard to sorting and recycling. The recyclability of these types of packaging is influenced by the significant heterogeneity of the applications that distinguish them, as well as by the frequent presence of other laminated polymers. Generally, this type of packaging is not positively recognised and sorted, but remains in the residual part which, in the case of separate collection of plastic packaging of household origin, is used for energy recovery. In theory, this type of packaging could be positively sorted but the quantities are too low to make the process sustainable and efficient. In any case, since in Italy the separate collection of plastic packaging of household origin includes all types of packaging, citizens can also dispose of this type of packaging in the separate collection managed by municipalities, according to the methods indicated at the local level and after removing any residual content. The term bioplastics refers to different categories of polymers which can be distinguished from traditional polymers by their origin (from totally or partially renewable sources) and end-of-life (compostable or otherwise). Plastics that originate from renewable raw material derive, for example, from corn or sugar beet, but this origin in itself is not sufficient to guarantee their biodegradability and compostability. With reference to their end-of-life management, the distinction that must be made concerns biodegradability and compostability in compliance with the UNI EN 13432-2002 standard. Consequently, two macro-groups of bioplastics can be identified: those that are biodegradable and compostable in compliance with the UNI EN 13432-2002 standard and those that are not. With regard to the former, through real-life and laboratory tests, the actual biodegradability and compostability of the packaging is verified (characteristic of organic waste treated to produce compost; it must be sufficiently biodegradable so as not to hinder separate collection and the composting process or activity in which it is introduced). Packaging complying with the reference standard can be labelled with specific marks to communicate its compostability and biodegradability characteristics, such as the QUALITY MARK of the Italian Composting Consortium and of the Certiquality certifying body, the "COMPOSTABLE" Mark, the use of which is subject to the compostability certification issued by the DIN (German Standardization Body) certification body, or the "OK COMPOST", "OK BIODEGRADABLE" and "OK COMPOST HOME" Marks linked to the certifications of the TUV-VINCOTTE international certification body. Packaging made of biodegradable and compostable plastics according to the technical standard is nowadays used above all for the production of disposable shoppers and certain other types of rigid packaging (mainly disposable dishes, plates and cups) and flexible packaging (film for various types of bags). The main current application is that of disposable shoppers which, once the first useful life has ended, can be used again for the separate collection of organic waste. It is essential, however, to indicate the prohibition of leaving them in the environment since their degradation under conditions other than composting can take many years. There are also bioplastics that originate totally or partially from renewable raw material but which have the same chemical structure of the corresponding polymeric materials of fossil origin and identical purity criteria. These polymers have identical applications to those of the corresponding polymers of fossil origin. Biodegradable and compostable plastic packaging can be collected with organic waste, where organic waste collection is available, even if they are soiled with food residues. If the packaging has no food residues and according to the provisions of the competent local bodies, it can also be collected with traditional plastic packaging. As for bioplastics that have the same chemical structure as traditional plastics, the only difference between the two types of plastics is to be found in the raw materials used and in the upstream processes; properties, application performance and recycling are identical and even the secondary material deriving from the recycling processes of the two materials does not have any difference in quality. These bio-based polymers can, therefore, be included in the identification system defined in Decision 97/129/EC regarding the respective polymers of fossil origin (for example, PET of plant origin will be indicated with code 1, the same used for PET of fossil origin) and therefore be collected with plastic packaging. 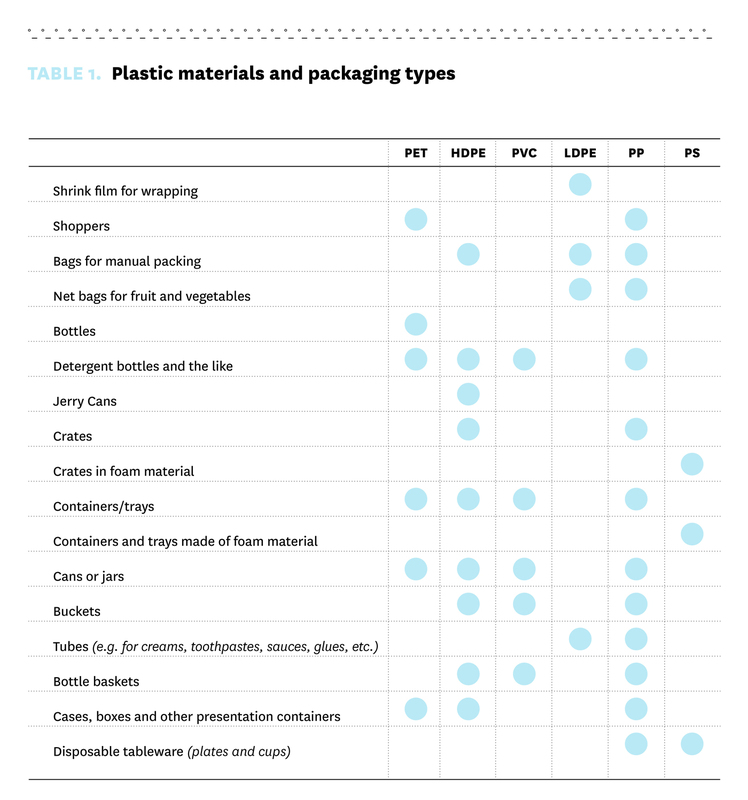 Below is a diagram useful for understanding the most frequent combinations between type of plastic material and type of packaging. Correct packaging design cannot ignore knowledge of how it will be used or all the processes that it must undergo from production to disposal and recycling. In order to design eco-sustainable packaging, it is also fundamental to understand what happens in the end-of-life/new-life phase. The following description, which might seem to be the mere narration of recycling processes, is, on the other hand, the starting point on which all the guidelines presented herein will be based. The description of the recycling chain provides an understanding of the phases that packaging undergoes once it has become waste. Furthermore, knowing the characteristic phases of the chain (collection, sorting and recycling) provides packaging designers with the possibility to implement alternative design processes aimed at proposing variations capable of becoming good solutions to be emulated. The subject of these guidelines is plastic packaging intended for household use which, therefore, in order to enter the recycling chain, passes through urban separate collection, the first link for the subsequent sorting and recycling activities or, alternatively, energy recovery where recycling is not currently technically and economically feasible. 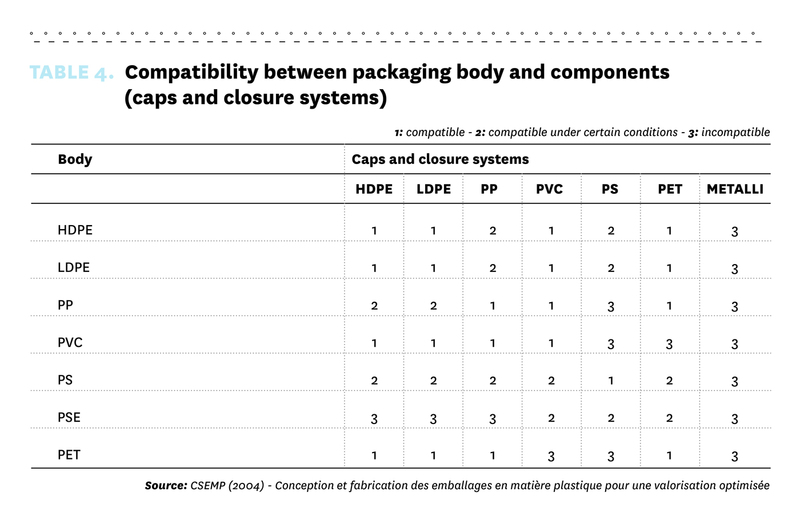 Most of this packaging consist of a main "body" (hereinafter also referred to as "structure"), for example the PET bottle, and of ancillary "components" necessary to confer on the packaging its multiple functions, such as the cap, the label, the glues and the inks that are applied on the body. In the current recycling chain, all the "components" applied follow the flow of the "body" and, therefore, different processes are necessary to separate them (where necessary). For this reason, there are currently specific indications that, depending on the component, allow the recycling of the main body of the packaging to be optimised. 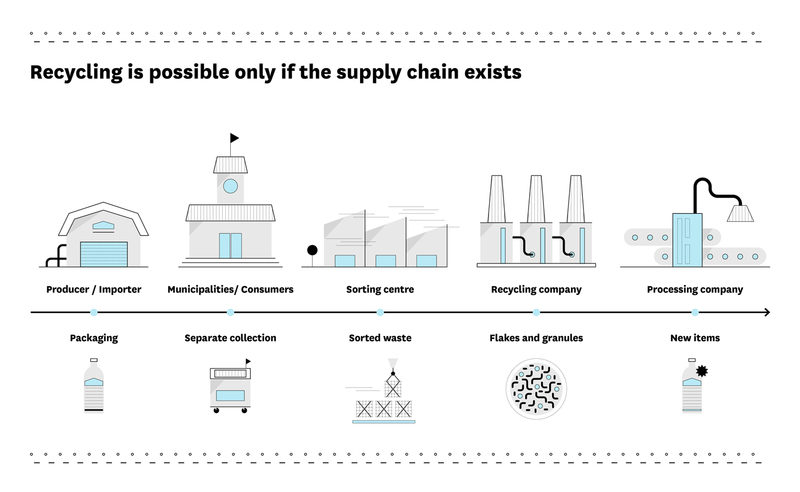 From a deeper knowledge of the functioning of the supply chain, it is possible to make further considerations, giving the designer the possibility of imagining different solutions. An alternative solution is, for example, that of ensuring that the user, when using the product, is forced to separate the different materials that comprise the packaging for the purpose of disposal: designing, for example, a tray in which it is necessary to completely remove its cling film to open it so as to automatically cause the consumer to dispose of the two materials separately, converts the packaging system consisting of the body (tray) and the component (film) into two separate elements/structures which, starting from the sorting phase, will follow different processes. This obviously makes sense where it is preferable that the components follow a different flow from that of the main body in order to increase the recycling yield of both. This is just one example of how knowledge of the recycling chain can lead designers to identify innovative solutions to facilitate the recycling of household post-consumption plastic packaging. However, the upstream (production) and downstream (company that converts secondary raw materials into new objects) phases are also fundamental. In fact, only if there is an adequate knowledge of the functioning of the flows and of each of the links in the supply chain it is possible to talk about design for recycling. The first phase is inevitably separate collection on the part of citizens. In this sense, it is useful to remember that the correct disposal of packaging in separate collection contributes to the optimisation of current recycling processes and the related yields. minimise the volume of containers such as bottles and detergent bottles and the like to increase the amount of packaging in relation to the volume occupied. It is, however, not such common knowledge that, for example, washing containers by the end user is often unnecessary and not recommended or that, among the ways of reducing the volume of packaging, there are some to be preferred (for example, it is preferable to flatten the side surface of bottles rather than crush them from the cap towards the bottom, because this makes the packaging more stable on the conveyor belts of the sorting plants and facilitates reading the material and separating the labels, or that packaging must never be put inside another in order to allow its correct recognition). This latter consideration is especially valid for those municipalities that optimise separate collection by collecting plastic and metal packaging together and separating the two materials at a later time. Metal elements of a certain size, if not intercepted and removed during sorting and recycling preparation operations, can damage the blades of the mills used to grind the plastic packaging. Correct separate collection is therefore a first sorting phase that takes place in the consumer's home and whose quality is a key factor for the entire recycling chain, which is why the instructions for the separate collection of household packaging waste play an important role. So what can the designer do? His ability also lies in not taking the collaboration of the consumer for granted and, as we will see later, in identifying solutions that automatically lead the consumer to act correctly (for example, as already mentioned, completely separating any components that could interfere with the subsequent recycling of the main packaging on first use of the packaging). Once collected, post-consumption plastic packaging reaches the sorting centres, where the materials go through different phases to generate homogeneous output flows to be used in the subsequent recycling activities. In this order or others, repeated according to need or subdivided into further sub-categories depending on the plant, these activities allow packaging coming from separate collection to be sorted into a series of homogeneous flows, each of which can be recycled. Following the sorting operations, the flows of residual packaging and the fine fraction are used for energy recovery. After the removal of cumbersome objects, post-consumption packaging is transported by conveyor belts to a special machine used for the unpacking and bag tearing operations. This is followed by sifting, generally one of the first phases, which has the purpose of separating sortable plastic packaging from contaminants and small packaging. The objective of this process is the separation of post-consumption plastic packaging and small residues, such as earth, stones, small pieces of other materials (wood, metals, glass), which will be separated from the main flow and then used in other forms of recovery. In these initial phases, packaging which is too large (usually drums or the like from non-household collection) and items which are too small to enter the sorting process are separated. Again thanks to a sifting process, rigid and flexible materials are separated and sent to separate sorting flows. At the end of this phase, the two flows (rigid and flexible) are distributed on conveyor belts, which generally move at a speed of 2-3 metres per second. The correct distribution of the material on the belt, avoiding overlaps and entanglement of individual packaging, is fundamental for the success of the subsequent sorting operations with detectors. in the second (by colour) the detectors are optical and, regardless of the material, recognise a specific colour. The combination of the two types of detectors makes it possible to sort packaging by material family and, subsequently, in cases where it is advantageous to improve the quality of the sorted material, by colour, depending on the flows to be obtained. The correct functioning of these phases therefore depends on the ability of the detectors to correctly recognise the post-consumption packaging in terms of both material as well as colour. This recognition is a rather complex process and it is the outcome of this operation that determines the flow in which the packaging will end up; it all happens in a fraction of a second. It is also useful to point out that in sorting with detectors, the individual components are not separated, for example trays and their cling film or bottles and labels, because the process recognises in every post-consumption packaging the main surface material, hopefully the body (but, in reality, not always). It follows that the flows obtained in this phase will not be completely homogeneous by material; in the subsequent phase, further cleaning may be necessary (normally manual, but in some special cases it could be passing under a detector), to obtain recycling material of adequate quality. The last phase is flow checking by specialised operators. This phase is used to verify that there have been no reading errors by the detectors or rather that the materials are not polluted with others that cannot be recognised by the detectors, as in the case of the presence of non-plastic materials in the sorted packaging, which cannot be recognised in an automated process, but only by attentive operators. This check can be present and repeated at several points in the process. This makes it possible to correct reading errors by removing packaging selected by mistake (for example because covered by other packaging) or that selected correctly by the detector but whose presence reduces the quality of the recycling material, for example PET trays in the flows of PET bottles. The material thus obtained is finally pressed into bales, stored and sent to recycling plants suitable for processing the specific flows. After the material sorting phase, the actual recycling process takes place. The flows, divided more or less precisely by material and, in certain cases, by colour, are sent, according to the types, to different processes based on four phases which, organised in a variable manner according to the structure of the plant, grind, wash, sort by flotation and dry the material that will thus be ready to be introduced into the production system as recycled material. The first element for the proper functioning of a recycling plant is the ratio of the plastic material to be recycled with respect to the residues and contaminations of other materials coming from any components introduced in the flow. It is therefore desirable that the material of interest (target material) is at least 80% of the overall weight; in certain cases, especially depending on the type of input flows, further sorting or cleaning may be necessary to obtain an optimal ratio between the different materials. After the bales are opened, the materials are loaded onto conveyor belts, which take them to the different phases. Before grinding, a metal detector is generally installed, which serves to identify and remove any metal residues in the flow that cause premature wear of the blades of the grinding mill and, if of considerable size, can, in some cases, seriously damage it. The identification of metal components is nowadays a technologically simple operation: the metal detectors used, depending on how they are calibrated, can identify both pieces as well as additives or paints with metallic pigments. The latter do not damage the blades but in some cases they are removed because they reduce the quality of the recycled polymer obtained. The first real phase of the recycling process is therefore mechanical grinding: the material passes through a mill, for example with rotating blades which, generally with the aid of water, shreds the material into tiny pieces. This process therefore makes it possible to obtain uniform elements regardless of their previous form or function: bottles, detergent bottles, containers, trays, caps, film and labels (depending on the flows) are thus reduced to a conglomeration of uniformly sized pieces of which more than 80% is the material to be recycled. The objective of this phase is to separate materials that hitherto had been connected by mechanical systems, such as screw or pressure caps. Grinding has no effect on materials held together by bonding, welding, extrusion or hot rolling. Grinding is followed by washing, which serves to remove residues and surface impurities. Depending on the type of polymer and the quality of the recycled material to be obtained, this can be carried out either hot or cold. In the simplest cases, only water is used; more frequently detergents, anti-foaming agents and other substances are added to facilitate the removal of surface contamination, in particular an oily nature. The attrition of the flakes against each other and against the blades provides the necessary mechanical action. If detergents are used, washing can be followed by rinsing with water to remove detergent residues. Then the third and most important phase of the recycling process takes place: separation by flotation. This is where the materials to be recycled are separated from those that are not involved in the recycling flow. The shredded materials are fed into a tank of water in which physical separation takes place by floating. 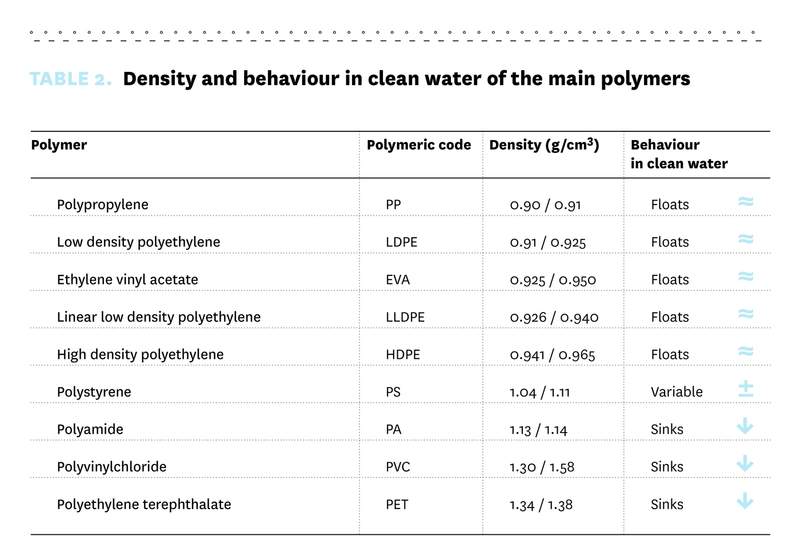 Depending on their density (which generally ranges from 0.90 to 1.40 g/cm3) PP, LDPE and HDPE float, while PS, PET and PVC settle on the bottom, having density higher than 1 g/cm3 (water density value). At this point, depending on the recycling plant, one of the two parts will be collected to recover the material of interest. Depending on the situation, the remaining part can also be recycled. This is the case, for example, in the recycling of PET bottles. During separation by flotation, the bottle flakes are collected on the bottom and are separated, while those of the caps (which are made of HDPE or PP) float and can be recovered to be recycled separately in another flow. It is therefore necessary not to mix the flow of one material with others having the same density, otherwise the sorting in this phase will be incorrect. The final phase is drying of the material, accompanied by possible dust removal. The residual moisture is removed and at this point the post-consumption packaging has been converted into a secondary raw material (SRM), which can be fed into a production process. The final result of a recycling plant consists of the flakes of washed material. In certain cases, as in the recycling of HDPE detergent bottles and PET bottles, the flakes can be directly used as a secondary raw material to produce new products. In other cases, the recycling process can be concluded with extrusion of the material, in order to obtain a uniform material in terms of size and colour. This latter phase produces a product in granules (generally similar to lentils) of similar size to those of a virgin polymer and therefore more easily manageable in a production process. Extrusion also provides the opportunity to add additives, fillers or dyes to the recycled material, which improve the characteristics for the type of applications for which the material is intended. 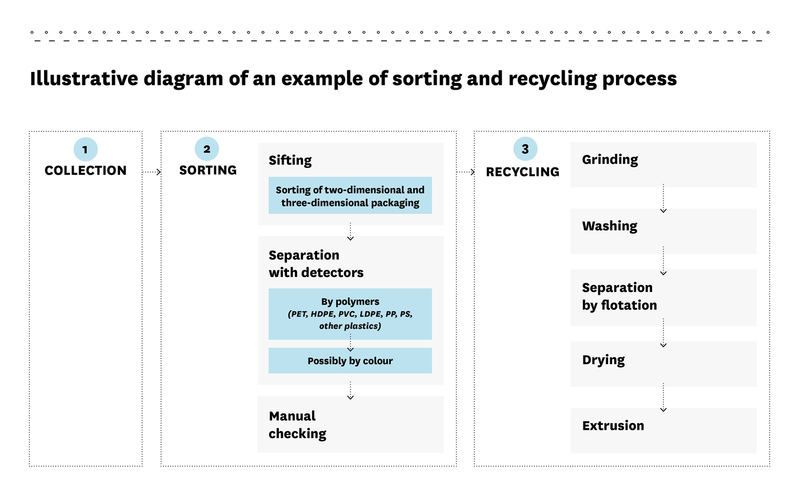 Below is a diagram that illustrates and summarises the sorting and recycling processes. The general scheme proposed can be contextualised with examples of possible processes of different types of packaging with the current state of the art, considering the available technologies, also in relation to the materials currently entering the platforms. 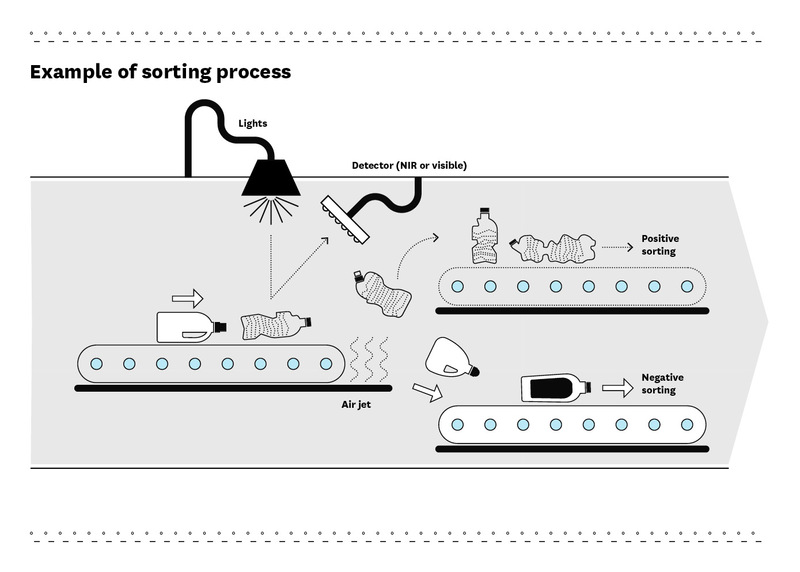 The figure below shows examples of the sorting and recycling processes of three different packaging types: a transparent bottle, a detergent bottle and a film used for wrapping. The three types follow similar process steps, but already in the sorting phase, the processes diverge and, in the final phase, each type has a process that corresponds to a different recycling plant dedicated to the type of material. The indications presented here are intended to offer a tool to design packaging for the final consumer that facilitates sorting and recycling activities. These indications are based on the current technological state of the art of industrial sorting and recycling plans in Italy and will therefore be periodically updated to adapt them to the state of the art of technology and markets. The facilitation of recycling operations and the increasing attention to the exploitation of the materials used to produce packaging are an important strategy, not only at the environmental, but also at the economic and communication level. In principle, all plastic packaging is recyclable, but the real possibility that this happens depends on the correct separate collection by the end consumers, the technology in use, as well as the economic and environmental viability of the recycling activities. For this reason, it is advantageous to use these guidelines both to analyse and evaluate existing packaging, as well as and above all to design new ones. Using the guidelines at the beginning of the design of new packaging will, in fact, avoid or reduce subsequent critical issues in the sorting and recycling phases, reducing environmental impacts, in line with applicable European legislation. Thanks to recycling, in fact, the use of new resources for the production of virgin raw materials is reduced and significant environmental benefits are obtained. As developed in the introduction, the fact remains that the packaging design must always start from a careful evaluation of the characteristics and type of product to be contained in order to guarantee full consistency between the structural aspects and the product protection needs, subsequently defining the most appropriate packaging type and the most suitable material. Aspects such as consumer safety and regulatory compliance are a priority. Only then it will be feasible to complete the design of the shape of the packaging, its adaptability, packing and use procedures, as well as aspects related to logistics, display at the point of sale and its end-of-life be finalised. It follows that a first general indication is to carefully evaluate each case individually in order to find the right balance between performance, regulatory and safety requirements (which are mandatory) and facilitation of recycling activities. It is, in fact, not possible in this sector to define an absolute guideline and to indicate general rules valid for all situations; this is why these guidelines aim to stimulate the search for more recyclable packaging solutions, depending on the case, analysing the behaviour of the packaging and of all its components along the entire process from separate collection to production of the secondary raw material and not to provide axiomatic indications valid in all circumstances. radical: leads to the definition of a new concept of the product-packaging combination and/or the setting up of a new production process; it involves both the product system as well as its production process with a high degree of change. The demand for innovation often comes from all the players in the entire supply chain. In all three degrees of innovation, the designer can address choices that have an impact on the final recyclability of the packaging. Keeping safety requirements as a priority, it will be important to design packaging with constant attention to environmental issues, using design solutions consistent with the existing recycling supply chain or, where this is not possible or desirable, which do not negatively influence existing sorting and recycling processes which the packaging will be subjected to. In fact, for certain types of product, packaging more complex than required by the recycling process may be preferable and, due to its characteristics, it may even pollute the flow of material to be recycled if sorted. For designers, therefore, it is certainly essential to analyse and design packaging according to its recyclability, provided the functions it has to perform are ensured. It is also essential to take into account the entire flow in which the packaging could be sorted, especially where the packaging must have particular performance characteristics that involve ancillary elements and special treatments, and to assess whether it could have negative impacts on the recycling process or on the quality of the entire flow of recycled material. Each case, nevertheless, must be evaluated individually in every aspect for a design that safeguards the system as a whole. In this regard, it is good practice for the designer and the producer or user company to analyse in depth the effects on the recycling process of the solution they are choosing, in order to verify its impact and identify the best combination between the type of product contained and the method of storage and recyclability of the container. This aspect is all the more important the higher the market share of the product for which the packaging is being designed, because the quantity of packaging waste that will flow into separate collection and then into sorting and recycling plants will be greater. Another issue strongly linked with the shelf life of the product is that related to portion rationing, which sometimes become single portions, for the purpose of reducing product waste. This happens, in particular, in the case of food or medical packaging, also due to the social changes in progress and the reduction in the number of family members. Facilitating recycling activities does not mean, therefore, to discard a priori certain types of design solutions, but rather to calibrate a complex system of factors concerning the relationship between content and container that primarily contribute to product enhancement and secondly to optimisation of recycling processes. Plastic packaging is one of the most complex examples to be addressed from the end-of-life/new-life point of view: the higher the performance of the packaging, for example, as regards the ability to increase the shelf life of the products contained, the more managing the end-of-life of this packaging risks becoming complex when it becomes waste. The concept of facilitating recycling activities is therefore fundamental. Introduced by Conai as one of the prevention levers, this facilitation is achieved in all innovations aimed at simplifying packaging recovery and recycling phases, such as the implementation of single-material packaging or the sortability of the various components (e.g. labels, caps and dispensers, etc.). It is precisely for this reason that the rational intervention of designers becomes fundamental to make production increasingly adherent to the demands of the circular economy in which the "waste" of one production process becomes the "food" for the same or another process, with not only environmental benefits, but also evident economic advantages and optimisation of the use of resources/time/activities (according to the European Commission, it is estimated that, in Europe, it is possible to reduce the need for material production factors by almost 20% in less than twenty years). The indications presented here constitute a basis on which to start a process of paying increasing attention to facilitating recycling activities. Topics related to packaging in its overall configuration, but also specifically for individual components, will be addressed. By components is meant closure systems (caps, tamper-proof systems, seals, film), accessibility elements (handles, spouts, etc.) and graphic and printing elements (labels and sleeves, inks, glues and adhesives). For more detailed information on the various topics, use of the indications and references in the appendices of this document is recommended. In the specific case of PET bottles, there is a European reference, sponsored and developed by the entire supply chain: the guidelines of the European PET Bottle Platform (EPBP). This document, the result of significant synergy among the various players involved, is the concrete testimony of the importance of the work and collaboration of the supply chain in tackling such an important and complex issue as that of the recyclability of a packaging type; complexity also due to the need for constant monitoring and discussion among the various players. The EPBP was founded in 2009 by a voluntary initiative bringing together experts in the design, production and recycling of PET bottles, with the aim of providing an objective and independent analysis of the existing technologies in the PET bottle recycling sector, and an assessment of the impact these technologies tend to have on recycling processes in Europe. The platform is supported by some of the most important European organisations and associations involved in this issue, such as the European Federation of Bottled Waters (EFBW), the European Association of Plastic Recycling and Recovery Organizations (EPRO), Petcore Europe, Plastics Recyclers Europe (PRE) and the European Non-Alcoholic Beverages Association (UNESDA). For companies that develop innovations on PET bottles (for example resins, additives, technologies and new production processes), several indicative tests have been set up to assess their compatibility with recycling processes. Furthermore, an evaluation process is available, supported by a group of experts working under the constraint of confidentiality which, in the event of a successful conclusion, leads to the issue of a certificate of compatibility that the company can use to promote its solution. The EPBP guidelines contain design indications for three types of PET bottles: transparent and blue-tinted PET bottles, transparent coloured PET bottles and opaque PET bottles. The indications provide suggestions on the possible choices regarding colour, size, labels and sleeves, closures and components, barriers and additives, adhesives, inks and direct printing. Low compatibility – this includes elements that have not passed the test or elements that have not (yet) been tested but have a high risk of negative interference with PET bottle recycling. The relationship between content and container is particularly important in packaging intended for end consumers because it affects the overall assessment of the environmental preferability of a packaging type. Among the fundamental issues for facilitating recycling activities - if one considers precisely the relationship between content and container - is the elimination of residual contents from the container. One of the greatest difficulties in recycling indeed consists of residues inside the packaging. Residues represent a dual problem since they constitute, on the one hand, a loss of product that could be avoided during the design phase, guaranteeing to the consumer who bought it to be able to make full use of it and fully exploiting the resources (raw materials, energy, water) used to produce it. On the other, the presence of residues and difficulty in emptying the container can cause elements to enter the recycling process that require a greater use of water and detergents or that contaminate it. It is therefore an issue that affects both the environmental as well as economic aspects. Indeed, all packaging must be emptied of liquids, creams and other residues it contains to facilitate recycling operations. The operation of emptying and eliminating impurities can, in certain cases, make the recycling process uneconomic and unsustainable from the environmental point of view, or compromise the quality of recycled materials due to the presence of residues which cannot be eliminated. In this case the problem concerns both the emptying and cleaning operations as well as the plant water purification systems. Moreover, the weight of residues can compromise the sorting of post-consumption packaging into the correct material flows. Undoubtedly, the fact that residues remain inside packaging after use depends, to a considerable extent, on its formal and structural configuration. As a consequence, careful design can solve or at least limit this problem. 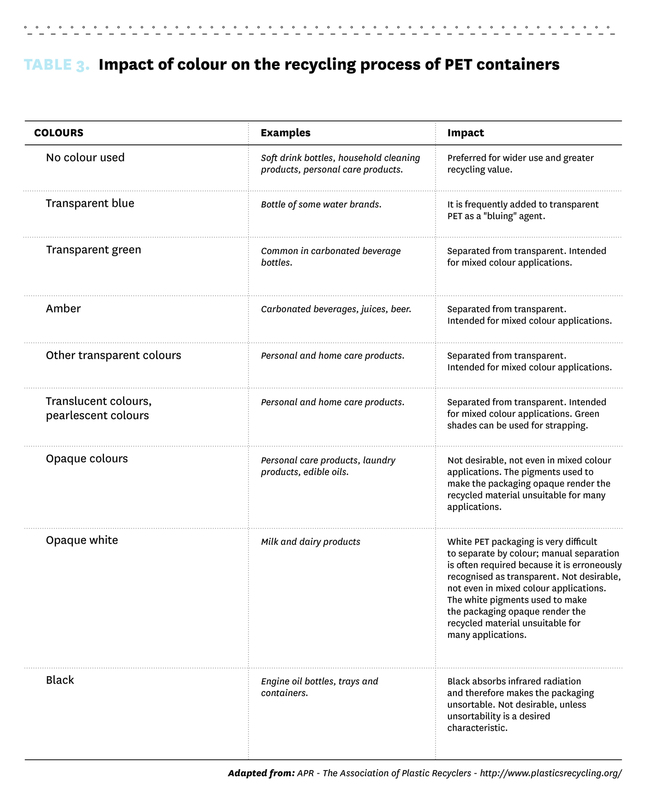 In fact, product residues left in the packaging may derive from a conscious decision of the consumer or from difficulty in extracting the contents from the container, stemming from the shape of the container (as may happen in the case of tubes) or from the characteristics of the contents (e.g. quick drying products). In these latter cases, one can speak of UPR (Unintentional Product Residue). In fact, according to certain European research, most users are unaware that there is still product in the packaging that they are about to throw away. The same research has also shown that, on average, 3.7% of product in the case of shampoo, 5% of honey and 26% of toothpaste remains in the packaging. Designers, therefore, can intervene precisely on facilitating emptying. There are several solutions that are easily applicable and frequently used to increase the ease of emptying containers. For example - where possible without risking loss of content during use or a problem user safety - wide-necked packaging or that which can be easily turned upside down has been used, as well as squeezable packaging that can be squeezed until fully empty. Also the possibility of making the level of the product content visible can help users pay attention to complete emptying of the packaging. Moreover, where feasible, it is also possible to intervene on the product, for example by increasing its fluidity so as to facilitate normal emptying by turning the packaging upside down. A further intervention by designers can involve verification of possible solutions with categories of users of different age, capabilities and physical and mental abilities, so as to understand in advance when and where unexpected problems can arise in the use of the container and its contents. Evaluation indices of cleaning of residues exist at the international level. Recyclass, for example, uses two indices: the easy emptying index (in particular for bottles or tubes) and the easy access index (in the case of jars and trays). Both calculate the percentage of product that remains in the package after its normal emptying. On the other hand, there are currently no objective data on what constitutes an acceptable residual level as this depends on the size of the package and on the viscosity of the product. Indicatively, for non-viscous products (i.e. in which the density is similar to water), it is advisable to have a maximum residue in emptying tests, at the moment when the packages are considered to be empty, of less than 10% for 50 ml-99 ml packages, less than 5% for 100 ml-499 ml packages and less than 2% for packages exceeding 500 ml. For more viscous contents, there is no optimal quantity of residues since this is highly related to the characteristics of the product contained. However, the issue of packaging cleaning assessment systems is still in its highly interesting infancy. in the case of packaging that is difficult to clean, choose a packaging that allows separation of the soiled part from that to be recycled. Pigmentation and the use of dyes in polymer packaging are essential factors that definitely interfere with the plastic recycling process. Firstly, the impact of colour on the possibility of application of the recycled polymer must be considered, since in general transparent recycled plastic can be more easily coloured and lends itself to a greater variety of final applications than that already coloured which involves greater constraints. For this reason, particular attention is paid to sorting by colour in recycling plants. For example, in the case of PET containers, recycling normally requires sorting that separates transparent from blue-tinted or coloured containers, thus envisaging differentiated flows. Another fundamental aspect concerns the significant absorption of light by coloured plastic. This can interfere with the operations of automatic sorting machines which, as we have seen (paragraph 3.B) use NIR spectroscopy to identify the nature of the plastic material. This is particularly the case with pigmented polymers with dark colours and black, which have difficulty in being identified by optical detectors to be positively sorted. In the design phase, it is therefore appropriate to consider a limited use of colour, consistent with the needs of the content and with the corporate branding and marketing choices. Regarding possible direct printing on the packaging body, unless inks which are removable by the traditional washing process are used, the use of this solution instead of the pigmented polymer must be carefully evaluated. For example, it would be better not to print directly on transparent rigid packaging, while on coloured packaging direct printing could also be preferable when this avoids the use of glues and labels. If the use of colour is indispensable, designers, depending on the type of packaging chosen, should devise alternative solutions, such as the application of labels and sleeves, provided that these leave a sufficient part of the packaging uncovered so as to allow it to be recognised. 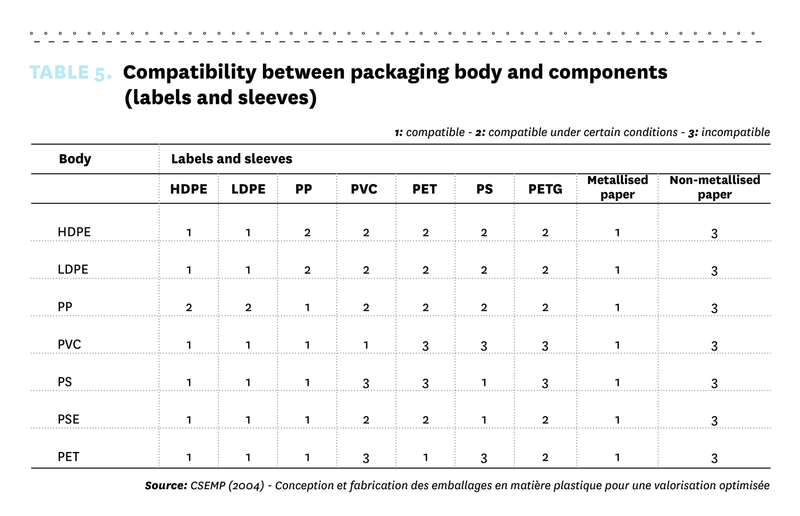 If a very colourful or decorated packaging is desired, it is indeed possible to use sleeves usually of different material from the body of the packaging (in particular: with different density) and which can be separated from the body already in the collection phase (with the collaboration of the consumer who must remove the label using a perforation or making sure that the sleeve detaches itself from the packaging automatically at the time of use) or during the first sorting and recycling phases in order to optimise the process. The use of fully covering sleeves should be limited to specific situations where this solution is necessitated by other needs. evaluate the use of labels/sleeves instead of direct pigmentation. Surface treatments are applications that allow the body or a component of the packaging to acquire performance that improves its physical, chemical or aesthetic properties. Similar to the superficial application of a colour, these treatments can have dimensions ranging from nanometres to micrometers and generally have the function of improving the packaging performance. Without the proper precautions, they can however complicate its recyclability. In general, these treatments should only be used in cases where their performance is strictly necessary in the use of packaging. A treatment that, for example, creates a chemical or physical barrier for better or longer preservation of the contents or a treatment that increases the mechanical characteristics of a material - thus making it smaller in size and weight - provide packaging with performance that fully justifies their use. It should therefore be reiterated that the considerations on the use of a surface treatment cannot be of a general nature, but should be considered on a case-by-case basis, evaluating the positive aspects of the treatment over the entire life cycle of the product-container combination. Having as a priority product performance, however, there are certain indications that, with regard to recycling, make certain treatments preferable to others. With reference to surface applications, these will interfere in particular in the sorting phase, since they can alter the correct reading of the optical detectors, thus not allowing recognition of the materials on which they are applied or altering their colour reading. Reading errors can, in fact, lead to the pollution of a flow, which is why it is preferable to reduce the use of these treatments or in any case verify the problems on a case-by-case basis. It is also useful to highlight that reading errors occur mainly in treatments involving larger surfaces (e.g. the entire body of the packaging) or greater thicknesses, since it is easier for the latter to form a layer that is read instead of the material on which it is applied. For this reason, it is always preferable to minimise the use of treatments. Some treatments involve the lamination of different polymers or of polymers and other materials (e.g. insertion of an aluminium layer). These treatments often provide particular protection and/or extension of the product shelf life. In general, it is preferable to avoid lamination but, when this type of treatment is strictly necessary for product protection and preservation, it is preferable that the laminated polymers are mutually compatible in terms of recycling. In recycling, these treatments can influence all subsequent processes in a different way. A good alternative could be provided by soluble treatments or those which detach during drying. It is also important to bear in mind that surface treatments should not alter the density of the materials on which they are applied, since this would interfere with the flotation sorting phase. Considering how this phase takes place, a variation in density leads to an incorrect classification of the material, thus polluting the output flow towards recycling. Therefore, in general, referring to surface treatments means defining a wide variety of solutions that differ in terms of type of material (what the treatment consists of), characteristics (e.g. if soluble in water) and quantity used (what kind of treatment); for these reasons, it is necessary to evaluate their specific compatibility with the process of which they will be part. As regards rigid or flexible multilayer packaging, on the other hand, the issue of contamination of the basic material becomes more complex. Currently, existing technologies can only recognise the polymer that constitutes the packaging surface since, at the moment, a technology that can distinguish multilayer from monolayer packaging is not available on an industrial scale. As a result, multilayer packaging may be sorted into a flow of homogeneous packaging of the same polymer. If the two polymers are mutually compatible at the recycling level and if the non-prevalent polymer layer in the flow is very thin, this packaging will not represent a problem in the flow, if the flow is sufficiently homogeneous (this is the case, for example, for packaging consisting of HDPE and LDPE, or PP with a barrier layer of EVOH). If, on the other hand, the polymers are not compatible at the recycling level, the packaging could represent a problem for the entire flow (this is the case of PVC in PET). if it is necessary to use multilayer packaging, prefer polymers with different densities. Analysing the relationship between the body and its components, means evaluating the relationship between the main packaging - which determines the recycling flow - and the elements constituting the closure system, labels and everything that is not necessarily made of the same material as the body. In general, for the proper functioning and correct efficiency of a recycling process, it is useful that the residues and the parts made with materials different from that of the main body can be easily sorted by a simple mechanical action. As far as possible and without prejudice to the performance requirements of packaging, it is therefore good practice to use the smallest possible number of components, types of polymer and materials. Specifically, it is desirable that the plastic material of interest (which, depending on the flow, may be a single material or a subdivision of the same by colour) is at least 80% of the total weight. It is important to highlight that the relationship between the components and the body mainly depends on the recycling flow in which the packaging or the main body (which is the part of the packaging that the designer decides to design to be recycled) will end up and on its characteristics. As we will see, these two variables could radically change the use of a given component depending on whether the reference flow is, for example, sorted by colour or only by material. In addition to attention to the weight of components for recyclability of the packaging, it is also important that the components do not prevent the correct reading of the body in order for it to be properly sorted. In the sorting phase, it is necessary that the readers are able to recognise the main material, especially when the materials of the components are different from those of the body. Indeed, it is essential that the surface of the packaging body covered by components allows efficient sorting and flow separation. In certain cases, for example in trays in which the body and its cling film are of two different materials, it is preferable that the packaging is not recognised differently depending on its position with respect to the optical reader (i.e. on whether the tray or the film is exposed to the reader), but that it can be unambiguously recognised. Similarly, extraneous materials should not hinder packaging reading. Here consumers come into play; for example, in blisters with the top part in plastic and the back in cardboard, they should separate the two materials and dispose of them in their specific separate collection. A specific follow up about the labels used on bottles, detergent bottles and jerry cans with a volume un to 5 litres. If these labels size is up to specific parameters of coverage of the packaging surface, they can compromise the identification of the polymer which composes the main body of the packaging, forbidding the selection. Indeed, the detectors identify the polymer composing the surface of the main body, in order to proceed then to the sorting of the packaging that are to be sent to recycling; what is not sorted in the main stream is sent to other flows or it is scrap. labels which cover less than 50% of the lateral surface of the main body, if the packaging has a volume up to 500 ml. Alternatively and when it is strictly necessary to use a high covering label, those labels should be designed with a hallmarking that helps to separate the main body and the label when it comes to dispose the packaging, and indicating to the end consumer to act this way, thus disposing separately in the collection of plastic packaging, the main body and its high covering label, in order to not compromise the recycling. It is therefore necessary that, at the end of the sorting phase, the flows are well defined and, in general, it is preferable that there are no metallic components present in the subsequent phases which can create problems for the materials processing systems and pollute the result of the flows. For these reasons, metal detectors used in the sorting phase can identify metal parts, but also additives or paints with metallic pigments. In order to fully satisfy the needs of most systems, it is necessary that metallic components and elements are, more than others, easily separable from the rest of the packaging to be recycled and clearly identifiable by the detectors. In particular, in rigid packaging, metal components that are heat-sealed or glued to the body of the container should be avoided. Finally, in the recycling phase, the last and most important separation between body and components is achieved. This operation takes place, as already mentioned, thanks to a flotation process depending on their density. Based on this process, certain compatibilities between materials that it is preferable to take into consideration from the outset of the design phases are highlighted. In general, components should be implemented in such a way as to spontaneously separate during the grinding and washing processes so as to arrive separately at the flotation process. Otherwise, for example in the presence of particularly resistant welds or adhesives, the process is not effective. The tables show the compatibilities between different materials defined according to the characteristics of the recycling process. Since it is not possible to sort materials by individual types, but only by density, it is useful, for example, that in a flow of PET bottles there are no components such as cap or labels made of PS or PVC. This is because they cannot be sorted by flotation. Vice versa, if the components are made of PP, LDPE or HDPE, the flotation will be successful. For the same reasons, it is also important not to excessively alter the density of the materials, for example using mineral fillers (which increase density) or creating expanded structures (which reduce it), because flotation would lead, depending on the case, to the loss of material or, worse, contamination of the flow with unwanted material. For example, in the case of a PET bottle, the use of a label in expanded (lighter) material may be advantageous because it would separate more easily by flotation. The same reasoning can be made also when the recycling process is aimed at sorting a material of a specific colour. In this case, the presence of a component of the same material, but of a different colour, could, contrary to what could be intuitively expected, be counter-productive for the entire system. do not have metallic elements and, if they are present, invite/force their separation during collection. In general, where possible, it is advisable to use closure systems of the same material as the main body. But, once again, this principle is not absolutely valid, and must be evaluated on a case-by-case basis. There is packaging, such as PET bottles, for which it is better to use closure systems in different materials with density lower than water. In these latter cases, it is preferable that the materials of the body and of the closure systems have different densities to facilitate separation by flotation. Moreover, in cases where the closure systems occupy large surfaces, for example the cling film of trays, it is desirable that these do not create errors when sorting with detectors. It is therefore useful for these components to be separated before the sorting phase and to do this requires the involvement of users, either by inviting them or forcing them to perform this action when using the product. An example could be that of seals: these components, made of aluminium or non-compatible materials and made to be detached on first opening, are designed not to enter the recycling process, given that, due to their methods of use, they are generally disposed of separately from the body. In general, it would be preferable to avoid the use of seals, caps and other metal components. Again to facilitate sorting and recycling operations, the best solution is those closure systems that do not contain coatings and do not have residual rings or accessories when they are removed. Any coatings, together with the minor components (made with a different polymer), if present in very small quantities, do not significantly interfere with the recycling process or the quality of the recycled material, but, wherever possible, complete and total separation of the various material is always preferable. Crown caps, for example, are acceptable provided they are completely detached from the bottle on opening and cannot be pushed inside the container. In the design of the accessibility elements (for example handles and spouts) the use of materials identical to those of the main body is recommended, in order not to reduce the performance of the base polymer resin and increase separation costs. If it is necessary to use different materials, compatible, preferably non-pigmented, materials should be used. Furthermore, it would be preferable to minimise the number of different components of a given packaging (for example handles, transport aids, etc.) which, if present, should not be welded to the container and, if glued, should be able to separate in an aqueous detergent (hot as in the case of PET or cold as in the case of polyolefins) or in a caustic solution (between 60 and 80°C). choose closure and accessibility systems that are automatically and easily disposed of by the user separately from the main body, if of different material. Labels and sleeves are elements of considerable importance in the design of packaging and this is why some basic considerations are necessary. The types of labels and adhesives used have, in fact, important implications in the ease of recycling of the packaging since they can affect both the sorting phase (making the main material of the packaging and its colour more or less easily recognisable) and in the recycling phase (due to the presence of contaminants or fibres that reduce the quality of the recycled material). In general, labels and sleeves made of the same material as the body are preferable. If this is not possible, then it is appropriate to use, also in this case, materials with different density from that of the body so that they can be more easily separated by flotation. The use of a different type of material for the sleeve makes it possible to colour and decorate the surface of the container up to a very high percentage, while avoiding colour contamination of the main material. This helps to maximise the recycled material as long as the sleeve is separable from the body and does not completely cover it. As for the dimensional aspects, in order to avoid errors in the identification of the material used for the container, often the guidelines envisage coverage percentages not to be exceeded. For example, in the case of PET bottles, it is generally advisable not to cover more than 40% of the surface of the bottle so as to leave a free zone sufficient for the optical reader to correctly identify the polymer resin used for the bottle and its colour. For containers, tubs, trays and other plastic packaging, this percentage rises to 60% of the area. It would also be useful to design sleeves and security seals so that they can completely detach themselves from the container or be easily removed in conventional separation systems. A solution could be to attach the labels to the body with several small points rather than a large surface. This observation applies above all in the case where water-soluble adhesives are used (in particular in the case of paper labels) which will thus allow the two elements to be separated without leaving residues. Otherwise, the components and adhesives will act as contaminants. Moreover, in the case of paper labels, it is important that they do not disintegrate during the washing process, otherwise the fibres could end up in the recycled plastic, compromising the quality and possible reuse. Nevertheless, these labels may be used, provided they are attached with water-soluble adhesives and are not coated in such a way as to prevent their separation and removal. For this reason, the use of decorative/protective finishes (e.g. sheets, lacquers, varnishes, etc.) should be reduced to a minimum. In general, it is preferable to avoid the use of glues and adhesives, for example by using shrink-wrap labels which adhere to the packaging by mechanical action and are therefore easily separable during grinding. It is precisely in this phase that possible contamination of the glues in the recycling process takes place. Where necessary, the glue should allow the label to detach itself during washing (cold or hot) or dry separation. The adhesive should not dissolve in the washing water but should remain attached to the label itself, which, in turn, should be designed to subsequently separate by flotation. In addition, it is important that the glue in contact with the water after detachment loses adhesiveness, so as not to risk sticking to the polymer flakes prior to separation by flotation. Alternatively, it is nevertheless necessary to envisage that the glued parts are separated during collection or in any case arrive already separated in the recycling phase. Plastics Recyclers Europe (PRE), the European association of plastics recyclers, has drawn up a list of approved hot-melt adhesives and several experimentation protocols are being developed to evaluate the impact of glues and adhesives in European recycling systems. Inks and pigments selected to colour and print components and labels must comply with existing recommendations/restrictions on the use of heavy metals and health and safety regulations. These substances can, in fact, contaminate the recovered plastic. For these reasons, it is recommended to follow the indications and guidelines provided and regularly updated by the European Printing Ink Association (EuPIA). The use of inks and pigments suitable for contact with food constitutes a further safety guarantee for the quality of the flow of output material from the recycling process. Furthermore, in order to avoid contamination of the recycled flow, the pigments used should not be water soluble. 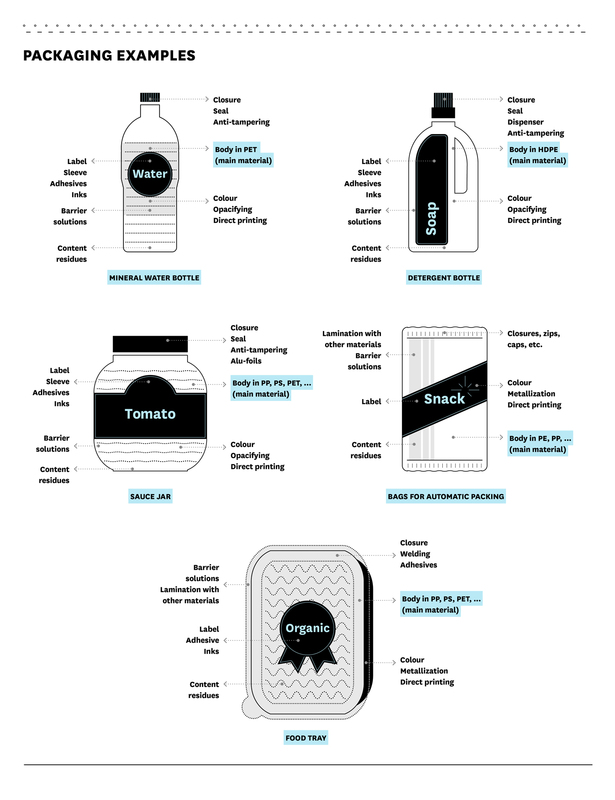 Below are some examples of plastic packaging, highlighting the elements to be taken into consideration during the design phase to facilitate recycling. The main body, i.e. the main component to be recycled, is indicated in blue. The sortability and recyclability of packaging intended for the household circuit are certainly very important characteristics and which should be strived for to ensure better environmental performance and lower use of resources useful for the production of virgin raw materials. At the same time, it is essential to take into account that the packaging must ensure certain primary services that represent essential functions that must necessarily be performed, such as correct preservation of the product and adequate use of the contents and of the packaging. Sometimes the services described here may not be mutually compatible. In fact, there are some types of packaging that, for particular preservation or application functions, can be sorted but, at the moment, do not have technical solutions for useful exploitation in a recycling perspective. Situations similar to the one described above deserve to be assessed on a case-by-case basis in order to identify the best technical solution. For these limited cases, it might be appropriate, for example, to choose solutions that render them unsortable and therefore uninfluential on the recycling processes and quality of recycled materials, through design interventions that consider the elements of attention proposed in this Guideline. It is expected that technological progress, both in packaging design as well as sorting and recycling processes, will in the future facilitate the dissemination of solutions that also ensure the sortability and recyclability of such types of packaging. As mentioned in chapter 3, the first phase for the recycling of household packaging is correct separate collection by citizens. For this reason, it is essential that end users are aware of good practices in the use and separate collection of packaging. In this sense, it is useful to remember that correct separate collection is fundamental for optimisation of current recycling processes and it is up to the end consumers to do it. Local authorities are, on the other hand, those responsible for collection organisation and management which, therefore, has heterogeneous characteristics throughout the country (e.g. different separate collection models, different collection methods, different colours identifying the different materials chosen at the local level). So, what can the designer or packaging user company do to facilitate packaging, once it becomes waste, being correctly disposed of in separate collection by the end consumer? It would be good practice to communicate to consumers that packaging should be emptied and, where possible, the volume reduced by crushing, while it would be useful to remember that packaging should not necessarily be washed, if emptying is sufficient to remove most of the product residues. In addition, plastic caps and closures should be disposed of together with their packaging, because if disposed of separately, they will lost in the fine fraction that is not recycled. These indications also refer to that specified by Conai in the publication "Etichetta per il cittadino – Vademecum per una etichetta volontaria ambientale che guidi il cittadino alla raccolta differenziata degli imballaggi” (Etiquette for citizens - Handbook for a voluntary environmental labelling that guides citizens in the separate collection of packaging) to which reference should be made for further information. The contribution of the designer becomes fundamental when, for example, he succeeds in communicating that the packaging is actually recoverable and that, to achieve this goal, it is essential to dispose of it in separate collection that in Italy includes all household packaging, regardless of its sortability and recyclability. The contribution is even more effective when the designer induces the user to perform virtuous actions almost automatically, without the need for precise training or information in this regard. This is why, right from the initial stages of the design process, the role of the designer can become fundamental for the definition of the communication methods and procedures to be used to ensure that the packaging is correctly disposed of in separate collection. In the knowledge that it is impossible to involve all users in carrying out specific actions, it is equally true that from the design point of view, the packaging designer can contribute to making the consumer perform the correct separation actions. As already mentioned, in Europe the identification of materials on packaging is voluntary, pursuant to the provisions of Commission Decision 97/129/EC. To facilitate the visual recognition of the various types of plastic by the consumer during separate collection, the main components of the packaging (containers, caps, lids) should be easily recognisable through the identification code of the material. For some years now, many companies, through individual initiatives, have been using immediately comprehensible communication methods in order to easily understand in which separate collection flow the individual packaging element should go (in particular, in the case of packaging made with parts of different materials, simple infographics can be used to indicate where the individual components should be disposed of). In any case, the symbols must be clearly indicated and possibly printed directly on the container or on the individual component. To avoid confusion, the identification code should be clearly distinguished from any other number or letter on the containers, avoiding, where possible, printing it on any labels. > how should it be managed? (i.e. whether or not it should be emptied or washed, whether or not its components should be separated). induce the user to automatically perform good practices instead of indicating them, for example by finding solutions that induce the user to separate the body from the components where necessary (for example sleeve-bottle). In the washing phase, non-soluble glues create agglomerations of heterogeneous material. do not completely cover the packaging body with labels and sleeves. HDPE packaging with a PS sleeve that completely covers the body is read as PS and separated into the flow of the non-prevalent material. Substance added in small quantities during processing to increase and/or maintain the performance characteristics of the materials to which it is added over time. In polymeric materials, this is used for the production of films, sheets and slabs: the mass of heated and thus plastic material is placed between two or more rollers to obtain the desired semi-finished products. Coating is the process by which a thin layer of fluid or molten material is applied to the surface of a substrate, which in most cases is a plastic film, but can also be a sheet of paper, a metal box or glass. A restorative and regenerative industrial economy that aims to keep products, components and materials always at their highest level of usefulness and value, distinguishing between technical and biological cycles. Moulding process for thermoplastics; it is carried out by pushing the molten polymer through a head having different sections depending on the semi-finished product to be produced (tubes, profiles, continuous yarns, etc.). Phase of the recycling process based on conveying shredded plastic material into water. The fragments having a density lower than that of the liquid float and can be removed from those which instead, having a density higher than that of the liquid, are deposited on the bottom of the flotation tank. This is packaging structurally made of different polylaminated materials, which cannot be separated manually. For example, the following items are laminated packaging: beverage carton (polylaminate: paper, plastic and aluminium), bag consisting of aluminium foil laminated with paper, etc. Mechanical process that takes place by opposing cylinders which, rotating on themselves, impress in the material the desired shape and thickness. The term lamination also indicates the operation by which a printed sheet is covered with a thin protective layer of plastic or metallic material called laminate. Scientific and objective procedure for the assessment of energy and environmental loads related to the system analysed, performed through the identification of energy resources, materials used and waste released into the environment throughout the life cycle of the product in a "from cradle to cradle" perspective. The LCA methodology has its origins in the '70s as a development of energy analysis, in which the strictly energy-related variables are supplemented with those of a typically environmental nature during the entire life cycle. Currently, the ISO 14040 and 14044 standards represent the international standard to which all analysts refer to develop and, where appropriate, have each LCA study verified. Assessment of products and the processes with which they are implemented throughout their entire life cycle, taking into account the resources consumed and the impact on the environment and on health. Phase of the recycling process which reduces the plastic material into flakes or granules. Set of waste that ceases to be such if it is subject to a recovery operation, including recycling, and meets specific criteria. Chemical operation in which a monomer is linked to a molecular chain to form the polymer. There are substantially two types of polymerization: by addition - monomer to monomer addition - or by condensation, where two monomers interact with each other and bind with the elimination of simpler molecules. High molecular weight organic chemical compound obtained starting from two or more monomers by polymerization reactions. Group of plastics including polyethylene – low-density polyethylene (LDPE), linear low-density polyethylene (LLDPE) and high-density polyethylene (HDPE) - and polypropylene (PP). Polyolefins are obtained by polymerization from oil or natural gas, where short chains of monomers join together to form long chains of polymers in the presence of a catalyst. Any operation the principal result of which is waste serving a useful purpose by replacing other materials which would otherwise have been used to fulfil a particular function, or waste being prepared to fulfil that function, in the plant or in the wider economy. Any recovery operation by which waste materials are reprocessed into products, materials or substances whether for the original or other purposes. It includes the reprocessing of organic material but does not include energy recovery and the reprocessing into materials that are to be used as fuels or for backfilling operations. Indicates the shelf life of a product, the estimated time of duration on the shelf, i.e. the period during which the quality of the product remains unaltered. Enveloping label. Plastic label that wraps around rigid containers such as bottles and jars, used as a communication support and/or as an additional closure system. Technique used for the production of single-body hollow objects, such as bottles, through the use of a controlled jet of air. Method of moulding plastic materials in which the molten polymer is injected into a closed mould. The shape of the cavity corresponds exactly to the shape of the desired part which remains enclosed on all sides. Plastic forming process in which a sheet of material is heated up to make it soft and malleable, then modelled into the desired shape by vacuum, pressure, auxiliary mechanical devices or combinations of these methods. Hot welding in which an intense heat wave is momentarily applied to the area to be welded, followed by immediate cooling. Pass an incoherent, granular or fragmentary mass through a sieve, both to separate the useful part from the slag, waste and foreign bodies, as well as to separate the elements of a given size from others of greater size. LAW 170 of 12 August 2016, Delegation to the Government for implementation of European directives and implementation of other European Union acts - 2015 European Delegation Law on light plastic bags, combustion plants, petrol and diesel quality. Legislative Decree 39 of 15 February 2016, Implementation of Directive 2014/27/EU of the European Parliament and of the Council of 26 February 2014 amending Council Directives 92/58/EEC, 92/85/EEC, 94/33/EC, 98/24/EC and Directive 2004/37/EC of the European Parliament and of the Council with a view to bringing them into line with Regulation (EC) 1272/2008, concerning the classification, labelling and packaging of substances and preparations. Legislative Decree no. 22 of 5 February 1997,"Implementation of directives 91/156/EEC on waste, 91/689/EEC on hazardous waste and 94/62/EC on packaging and packaging waste"
Requirements for packaging recoverable through composting and biodegradation.